JNN 17 Jan 2014 MUMBAI: The spiritual leader of Dawoodi Bohra community Dr Syedna Mohammed Burhanuddin passed away on Friday after a cardiac arrest in Mumbai. He was 102. His 70-year old son Syedna Mufaddal Saifuddin has succeeded him, it was announced here. Syedna Burhanuddin died this morning at his residence in South Mumbai, a spokesperson for the community said. “The 52nd Dai al-Mutlaq of the worldwide Dawoodi Bohra community, His Holiness Dr Syedna Mohammed Burhanuddin expired today at the age of 102 at his Mumbai residence at Saifee Mahal,” he said. Born in Surat, Syedna Burhanuddin was the leader of the Dawoodi Bohra community after succeeding his father Syedna Taher Saifuddin in 1965, Times of India reported. Under his leadership, the community has achieved remarkable social, economic and educational success across the world. Known as ambassador of peace and goodwill, he was highly respected by world leaders and governments for his endeavours in promoting international brotherhood and harmony,” a community spokesperson said. He was honoured with highest civilian titles like the Star of Jordan and Order of the Nile by the respective governments of Jordan and Egypt. Syedna was conferred Honourary Doctorates for his efforts in social and educational development by renowned institutes like Al-Azhar University, Cairo, Aligarh Muslim University and University of Karachi. Syedi Aaliqadr Mufaddal Bhaisaheb Saifuddin has ascended as the new spiritual leader of the Dawoodi Bohra community. He is the second son of Muhammed Burhanuddin. In Mumbai, the one of its kind Raudat Tahera mausoleum which has the entire Quran inscribed in letters of gold and bejewelled with precious stones; the world class Saifee Hospital; and the on-going ambitious Saifee Burhani Upliftment project of the redevelopment of Bhendi Bazaar are some of the major initiatives of Syedna in the city. In 2011, Syedna had proclaimed Nass (investiture) upon his second son Syedna Mufaddal Saifuddin in London. The 70-year-old successor is the rector of the community’s 200-year-old institution Jamea-tus-Saifiah, which has campuses in Surat, Karachi, Mumbai and Nairobi. “He was closely associated with the late Syedna and has received much of his spiritual guidance under the tutelage of his revered father. Highly respected among the community members, Syedna Mufaddal Saifuddin travelled widely with his father and met heads of states and other distinguished personalities across the world, he said. Among the many projects that Syedna Mufaddal Saifuddin has worked under Syedna’s directions in the restoration of famous Fatemi Masjids in Egypt and other edifices in the Arab world, he said. Syedna Mufaddal Saifuddin will lead the Namaz-e-Janaza of the late Syedna at Saifee Masjid at Bhendi Bazaar. 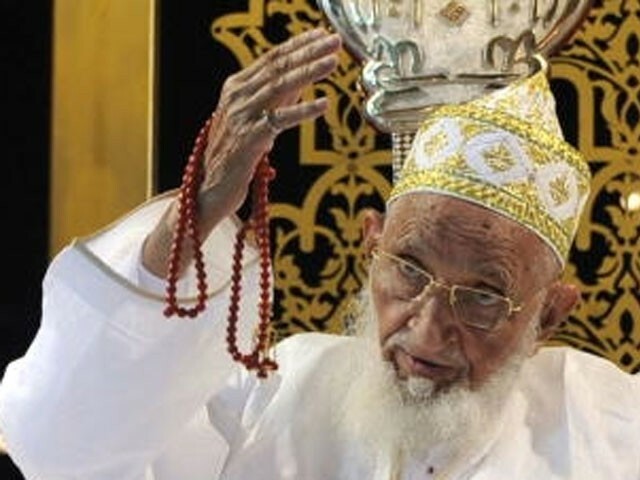 The late Syedna will be laid to rest at Raudat Tahera mausoleum in Mumbai. Thousands of Dawoodi Bohras from all over India and from around 40 nations are converging to Mumbai to pay their last respects and homage to their beloved leader Syedna Moahmmed Burhanuddin, he said. Dawoodi Bohra is a sect of the Shia Muslims spread all over the world. One of the key principles of the sect is “patriotism as part of the faith.” It encourages followers to make a positive contribution to the country they live in. The word Bohra means trader and traditionally, most members of the sect have been entrepreneurs. Last year, thousands of Dawoodi Bohras from across the world flocked to the city to celebrate Syedna Mohammed Burhanuddin’s 102nd birthday. Burhanuddin’s death was followed by a series of condolences from various Pakistani political leaders as the local Bohra community grieved the death of their spiritual leader. Prime Minister Nawaz Sharif and President Mamnoon Hussain also expressed their grief over Burhanuddin’s death and extended their condolences to his family. Sindh Governor Dr Ishratul Ebad Khan said that Burhan always followed the religious teachings and his efforts of Burhan for Islam and Pakistan can never be forgotten. Dr Ebad said the whole nation is equally sad over his death. The Governor also prayed for eternal peace to the departed soul. Sindh Chief Minister Qaim Ali Shah said the Sindh government was with Dawoodi Bohra Jamaat at time of this grief and announced that the national flag will remain at half mast on all government buildings on January 17 and 18 to express solidarity with the bereaved community who has been delivering marvelous services for the development of Pakistan. This entry was posted in Asia Pacific, Pakistan News and tagged Bohri, Dawoodi Bohra, Dawoodi Bohra community, Dawoodi Bohra Jamaat, Fatmid, funeral, Mufaddal Bhaisaheb Saifuddin, Mufaddal Saifuddin, Mumbai, Saifee Burhani Upliftment, shia, South Mumbai, Syed Burhanuddin, Syedna Burhanuddin, Syedna Moahmmed Burhanuddin, Syedna Mohammed Burhanuddin, Syedna Mufaddal Saifuddin, Syedna Taher Saifuddin. Bookmark the permalink. IN THE DEMISE OF SYEDNA BURHANUDDIN MARHOOM WA MAGHFOOR , THE ENTIRE WORLD SHIA COMMUNITY IS SAD AND CONDOLE HIS ACCENSION TO JANNAH . MAY ALLAH BA TASADDUQ CHHARDAH MASOOMEEN (A S) GRANT HIM A PLACE IN HIS JAWAR E REHMAH AND GIVE STRENGTH TO THE PASMANDEGAAN , THE BOHRA COMMUNITY AND THE ENTIRE SHIA COMMUNITY , TO BEAR THIS GREAT LOSS . MASHA ALLAH HIS QUITE LONG SPIRITUAL SERVICES OF SEVENTY – EIGHTY DECADES SHALL ALWAYS BE REMEMBERED WITH ADMIRATION, REVERENCE AND RESPECT.